Debut albums by legendary metal bands are always a tricky bunch when it comes to judging them, especially when looking back at the albums years after they were released. In some cases it can be the band's best work, their worst or it could just be an average album. So what about "In Battle There Is No Law!" the debut album of death metal legends, Bolt Thrower? An album that showcases the band at their most raw and primitive state (Not counting demos of course). Well, before the answer to that question, an even more important one. Is this album even a pure death metal album? 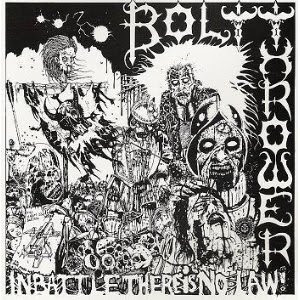 Bolt Thrower is of course a death metal band, but "In Battle There Is No Law!" is definitely not a pure death metal album, but more of a metalpunk or grind album. While death metal pioneers in the US, like Death and Possessed were creating their brand of death metal based on their love of thrash bands like Slayer, Kreator, and Dark Angel, Bolt Thrower was worshiping Discharge and other punk bands that roamed the UK at the time. The songs on this record are definitely more likely to be found on a Napalm Death or Repulsion album than a Morbid Angel or Obituary one. The classic death metal tremolos aren't present for the most part, but instead ridiculously intense riffs being pushed by punk-driven beats. Now, for the actual music. This record is pretty damn fast throughout, with some headbanging, mid-paced moments placed in the perfect spots.The album kicks off with the track "Attack in the Aftermath," which is one of the better songs on there. A cool drum intro starts the track and is followed by some power chords that resemble a lot of punk bands at the time (The tone), before being launched into blistering solos and fast riffs, accompanied by Karl Willets' savage vocals. This, more or less, is pretty much the description of all nine tracks on the record. Nothing but nontechnical solos, headbang inducing mid-paced riffs, great drumming, extremely fast riffs and a heavy vocal assault, and I wouldn't have it any other way. Back to the original question. Is Bolt Thrower's debut album their best, worst or is it somewhere in the middle? Well, there's no such thing as a bad Bolt Thrower album, but this one is definitely not their worst, but it isn't their best either. 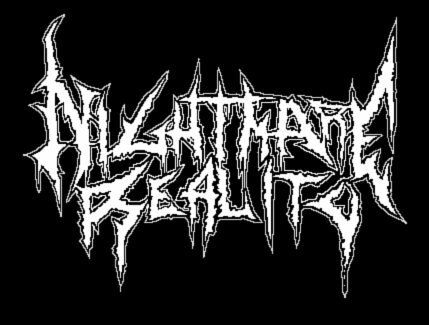 One thing is for sure though, this album was just the beginning of what would become the best overall death metal discography ever. "In Battle There Is No Law"